How do I take screenshots with a delay? While pressing Prnt Scrn mostly takes a screenshot there are times it doesn't do as intended. The most common case is when a dropdown menu is active. How do I take such screenshots? I want a solution that works with the default screenshot or screen capture tool that comes with my distro. The answer is quite similar for each distro. It requires you to use the "delay" feature present in these tools. The delay feature allows you to issue the command to take a screenshot after an interval that you specify. You can set this interval such that, after you have issued the command, you have enough time to bring up the screen you want to capture. 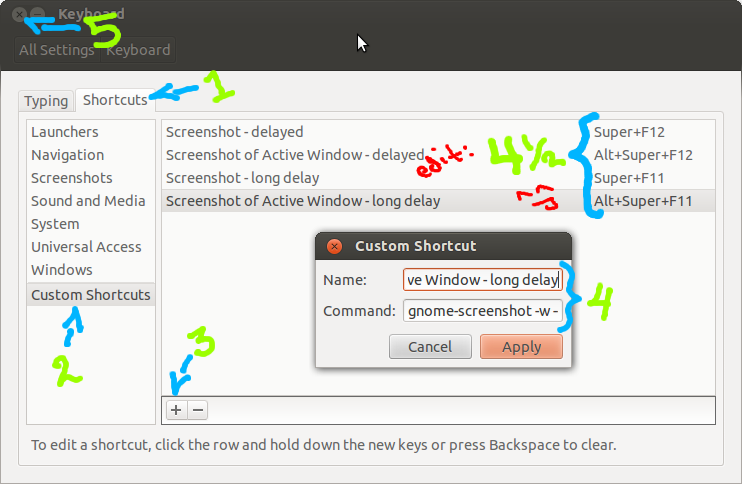 The exact way to set up a delay depends on each distro's default screenshot application. And, as often, you maybe able to do what you want via a GUI or a terminal or keyboard shortcuts. Some options will be exposed depending on what you choose. If you choose to grab the whole screen, the "Include the window border" and "Apply effect" won't be available. Set things up as you want. A five second delay is a nice starting point to let you bring up the actual screen you wish to capture. To get things going, click "Take Screenshot". Quickly set up what you want and wait. You'll hear the sound of an (old-fashioned) camera shutter and a new screen will appear. and the possibility to save it to the clipboard instead if you wish to process the image further. The default image format is .png, which is, in the opinion of some, a more suitable format than .jpg. 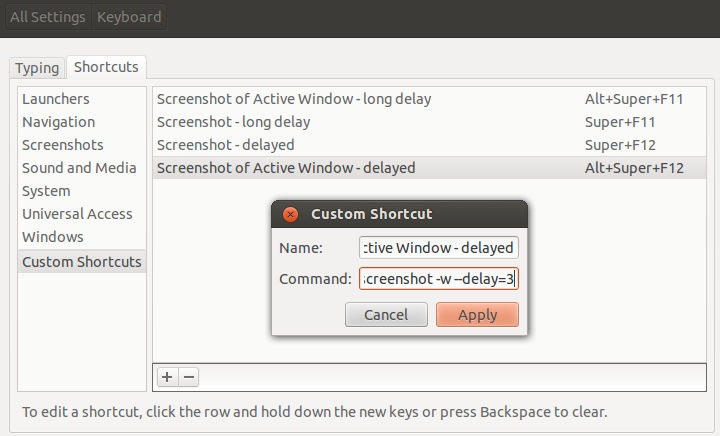 Note that the time delay feature of gnome-screenshot is not available if you choose "Select area to grab". Go into a terminal and run openbox --reconfigure. (You won't see anything happen and you'll get back your prompt if you haven't messed up anything. If you have messed up something, you'll get an error. That's when the back-up comes handy.) Running the command is a necessary step to ensure that your edits to lubuntu-rc.xml are now active. to save the image to your Desktop. What is described above basically enables you to just hit Prnt Scrn, then do what you want such as open a menu within 5 sec after which scrot takes a full window screenshot. It does this silently. Don't expect to hear or see anything. Running man scrot from a terminal provides you with more information on scrot. One can modify the code to take a snap of the active window only by the addition of -u and assigning the keybind of Alt+Prnt Scrn to this code. With both Prnt Scrn and Alt+Prnt Scrn, it is possible to add -q N to the code where -q tells scrot to save the image with a quality other than the default value of N which is 75. A high value will create a higher quality but larger file. According to man scrot the effect of -q is dependent on the image format chosen. 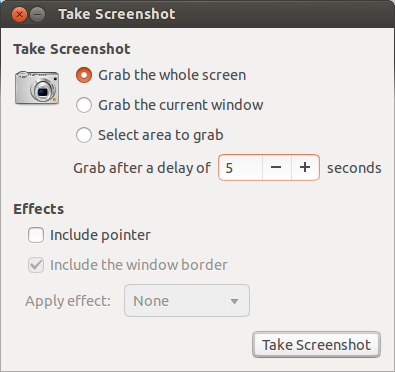 As with the GNOME screenshot tool, there are a few options but the delay function is not available with "Select a region". On clicking OK, another window appears with choices about saving the image to a file, copying it to the clipboard, opening it with programs that can manipulate images (as the dropdown shows), and even uploading it to a specific image-hosting service. If one opts to save the image to disk, a regular "Save as" screen appears allowing you to specify the name, file type, and location of the saved format. man xfce4-screenshooter has details of the switches available and those could help if a user is interested in modifying the functions of Prnt Scrn and Alt + Prnt Scrn to always use the delay option. Prnt Scrn could be set to xfce4-screenshooter -d 5 -f. Then, any time Prnt Scrn is pressed, xfce4-screenshooter will take a snap of the full screen because of -f after a delay of 5 sec and then prompt you for a filename and location. Alt+Prnt Scrn could be set to xfce4-screenshooter -d 5 -w to grab the active window because of -w.
I use a program called Shutter . To my knowledge it works on most of the desktop managers - I currently use is in Unity without problems, it works in the current Kubuntu and Mint for me as well. Furthermore, at the bottom you can see its also got a delay function. Its got a very nice basic editing tool as well as an app-indicator. I've been super please with it for a long time. 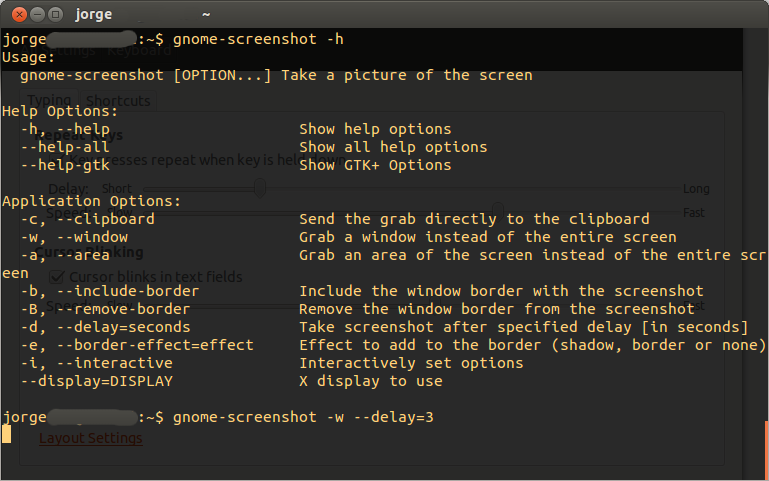 If you are running Ubuntu and prefer using the command line, gnome-screenshot should come pre-installed on the system and has some handy command line options (and you should be able to do everything you can do from the GUI via command line). There's controversy regarding this situation. That's it, but I'd also recommend setting 2 others that would give you more time to navigate deeper in menus. 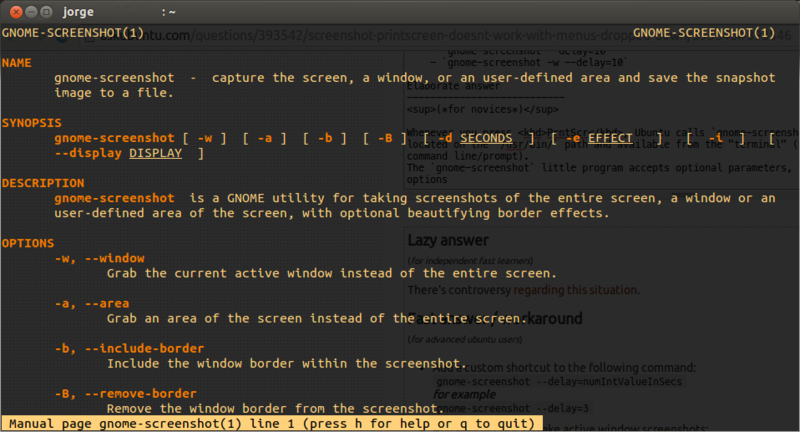 Whenever you press PrntScr, all Ubuntu does is calling gnome-screenshot which is usually located on the /usr/bin/ path and available from the "terminal" (teletype, tty, cli, command line/prompt), so you can use it in all sorts of ways to fit your funky purposes. Hit the + button to add your new custom shortcut. Give a name and a command. 4½. Assign the key combination you'd like. Close this window or it wont work. 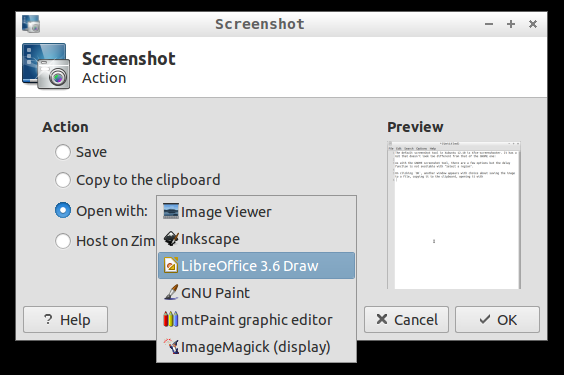 How to change screenshot file type from png to jpg when doing a Print Screen on Lubuntu? 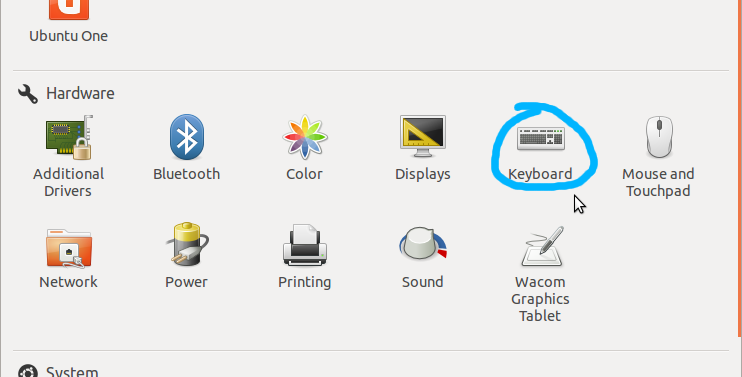 From where are application icons for the LXDE menu loaded? Screenshot without hiding context menus? 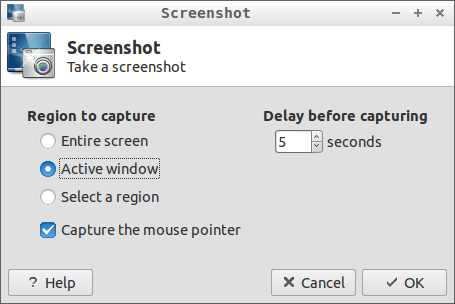 How can i change the default name for the screenshots made by gnome-screenshot? How can I take screenshots from inside a fullscreen program? Taking screenshots of all (or specific) virtual desktops/workspaces (or: windows beyond/larger than current desktop)? 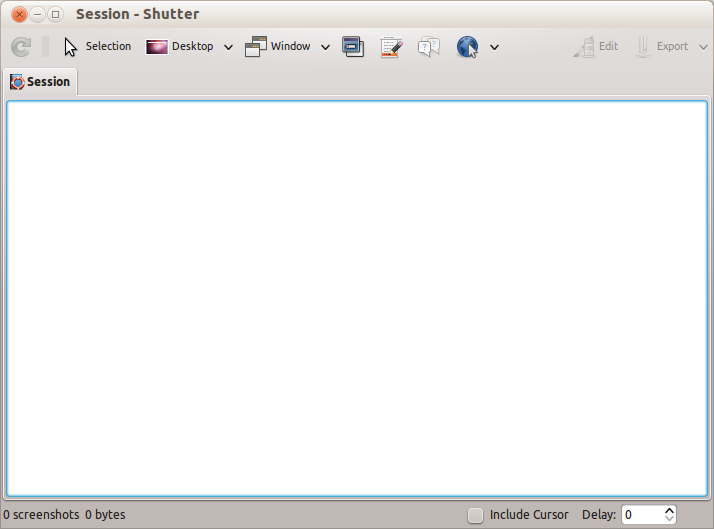 How to take screenshots with shutter while editor is open? How do I keep Screenshot open to take multiple screenshots? How to capture a screenshot immediately, without any confirmation, clipboard interference or screen blackout effect?